Colin Hay is Professor of Political Science at Sciences Po, Paris, and Affiliate Professor of Political Analysis and Co-Director of the Sheffield Political Economy Research Institute (SPERI) at the University of Sheffield. He is the author of many books including The Failure of Anglo-Liberal Capitalism, The Political Economy of European Welfare Capitalism (with David Wincott) and Why We Hate Politics. Anthony Payne is Professor of Politics and Co-Director of SPERI at the University of Sheffield. He is the author of a number of books including The Global Politics of Unequal Development and Development (with Nicola Phillips). "For years we have been told ?There Is No Alternative? to the debt-soaked, inequality generating model of neoliberal capitalism that we have had for the past 30 years. Well, now there is. 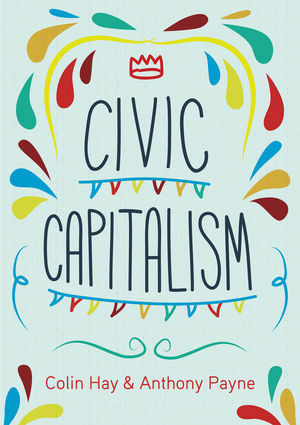 Hay and Payne call it 'Civic Capitalism.' I would call it our last chance for a future we would want to leave to our kids." "Anglo-liberal capitalism has failed spectacularly. It can?t be fixed or spun. ?Civic capitalism? may save us, say the authors of this vital, spritely book. And they are right. The powerful should be tied to chairs, made to read the book and shift their stubborn mind sets. If they don?t take note, the world is doomed."